If you run a website, even just as a hobby and not for your business, chances are high you are interested in analytics. How many people get to your site, which pages are viewed the most, where do they exit, how many come via Facebook or Search. Google Analytics is the de facto standard for this kind of data. What is also interesting is how users actually scroll and click on a site. Google Analytics can be used for this with Event Tracking set up. It needs some manual configuration and as a marketer you may be overwhelmed by the configuration you have to take care off. The outcome is still just a table of data and a few graphs in Google Analytics. That’s were Hotjar comes in handy as an addition to classic analytics software. Hotjar integrates in your website the same way as Google Analytics does, by adding a tracking script (for WordPress there is also a plugin which takes care of that). The feature set of this software is interesting, it’s a mix of tracking user behavior and user feedback. Recordings: How is a single user consuming content and navigating around on your site. Here are the features that I have taken a more in depth look at. 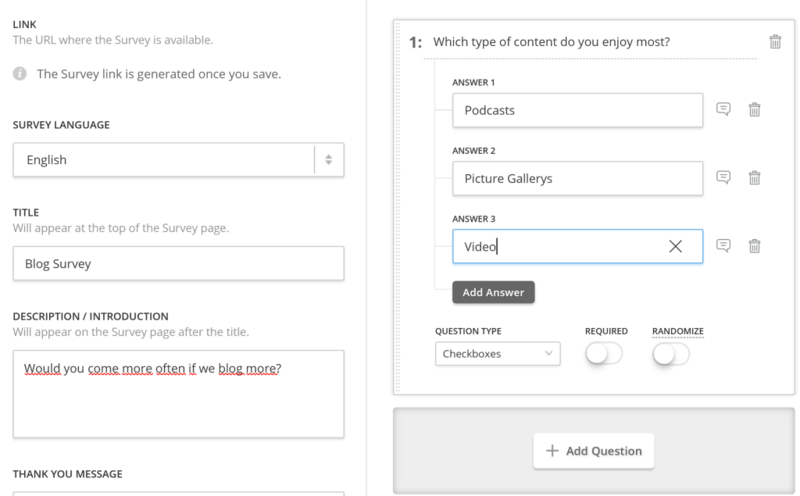 A great way of collecting feedback on how users “use” your site. How far are they scrolling? Where does the mouse move? Where are they clicking? You can do this for specific sites, like a product download page, the homepage of course or any page which is important to you and you need to optimize. I used this feature to learn more about a website project I recently started working on, a site for a software product which is used in the agile software developer community. 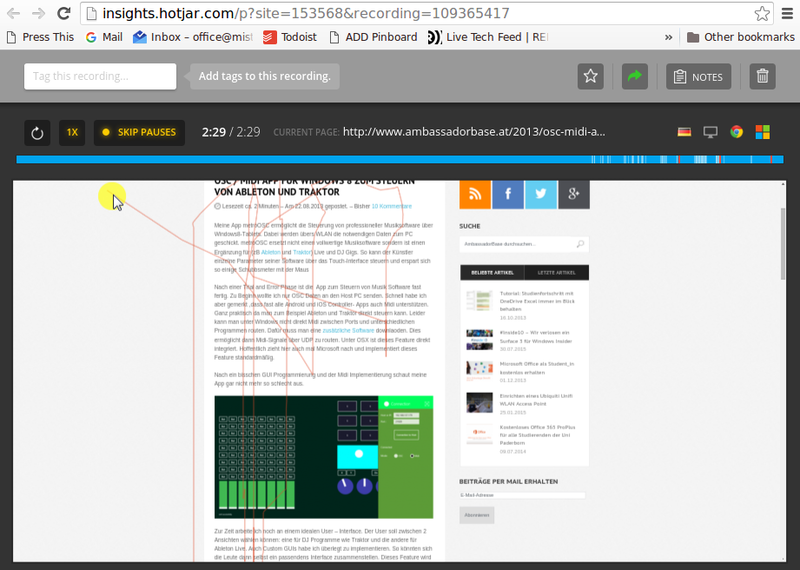 Before we head into outlining the structure of the new site and talking about which content to show and link from the homepage we used the heatmap feature of Hotjar to get a better feeling of how people use the homepage (which is cluttered with lots of options and buttons at the moment). This shows how a single user navigates on your site. Hotjar creates a video and allows you to actually see how the user navigates around. If you see this for the first time it really has a wow effect. If you look at the numbers in Google Analytics its a list of URL’s in a table or maybe a pie chart. Here you can see how an human being is consuming content on your site and interacting. That’s just cool to see! This feature allows you to create a report on forms you have already implemented on your site. You create a report by telling the name of the form and on which URL the form is on, Hotjar then detects the form and starts tracking at which input-field site visitors stop moving forward, which is a great way of optimizing forms which led to confusion. I have tried this for a very simple form (Workshop registration form with not enough traffic or complexity to optimize), but it worked right away. You get a preview of the form within Hotjar immediately and can check if it looks correct, after that it starts collecting data on it. 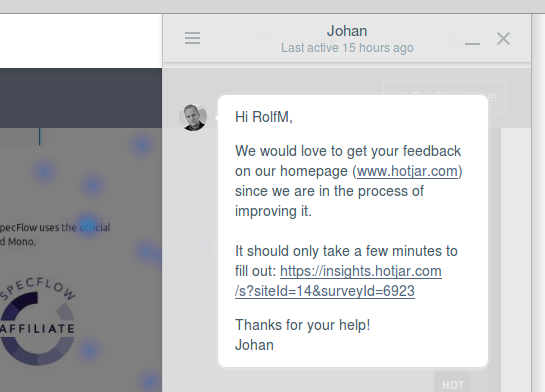 This is just a screenshot of how Hotjar themself is using their own service to ask people for feedback on their new homepage. You create a survey and can target it to specific pages and if it should show as a pop up. Each survey is also reachable via a direct URL which you could link to. The survey component is maybe not as powerful as surveymonkey or typeform. But it’s powerful enough for 90% of your needs. There is a basic plan which fits needs for most Startups and small businesses. The first paid plan starts at 29 EUR a month and I would argue that this is cheap if you look at the pricing of other tools which can often only provide part of what you get with Hotjar. They also have an agency offering if you want to use it for multiple clients. Overall the feature set of Hotjar is convincing, it combines things you have to split via several tools otherwise. You may use separate services for specific tasks like polling, feedback forms, heatmaps etc. and each adds it’s own script and may has impact on loading time. And it’s a great addition to existing web-analytics software you use on your site. Hotjar is blocked by Ghostery (an anti tracking browser extension) like most of the tracking scripts and maybe not all the features will work if you use caching plugins (i.e. 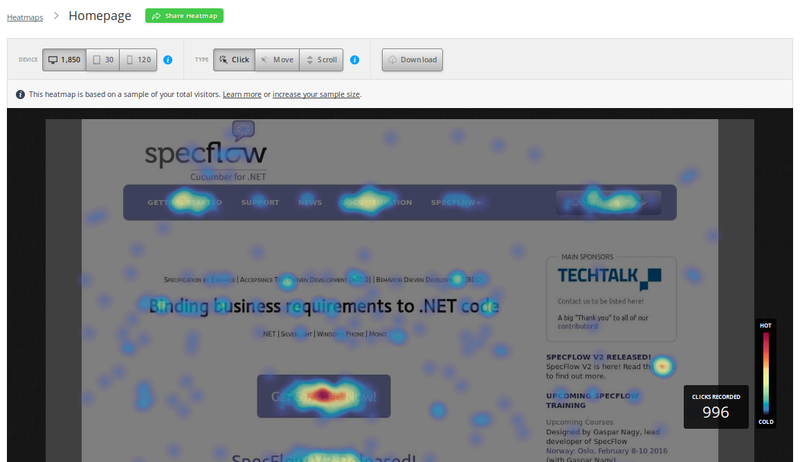 with WordPress I ran into that problem of not being able to collect data for a heatmap). You should not rely only on data generated by Hotjar but also do the leg work of manually asking users to give feedback on your site. Hotjar should be used in addition to classic web-analytics software and compare the results just to check if they add up. Check the Hotjar blog and specifically the Hotjar case study category to learn how people use Hotjar to further optimize their site.